The certification platform in Projecta is designed to provide an easy path for projects to be able to issue certification certificates. The system allows a project to approve one or more certification providers. These providers can then set up training centers and course conveners. Course conveners prepare a course and then attendees are assigned to that course. 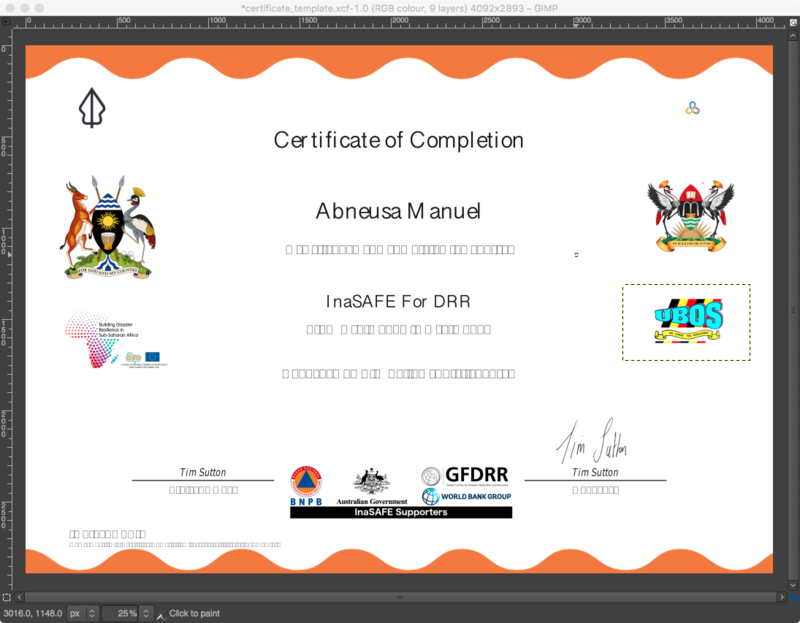 Once the course is completed, certificates get issued by the course convener in digital form. There is the opportunity to charge a fee for each certificate issued. This mechanism can be used to support the parent project. 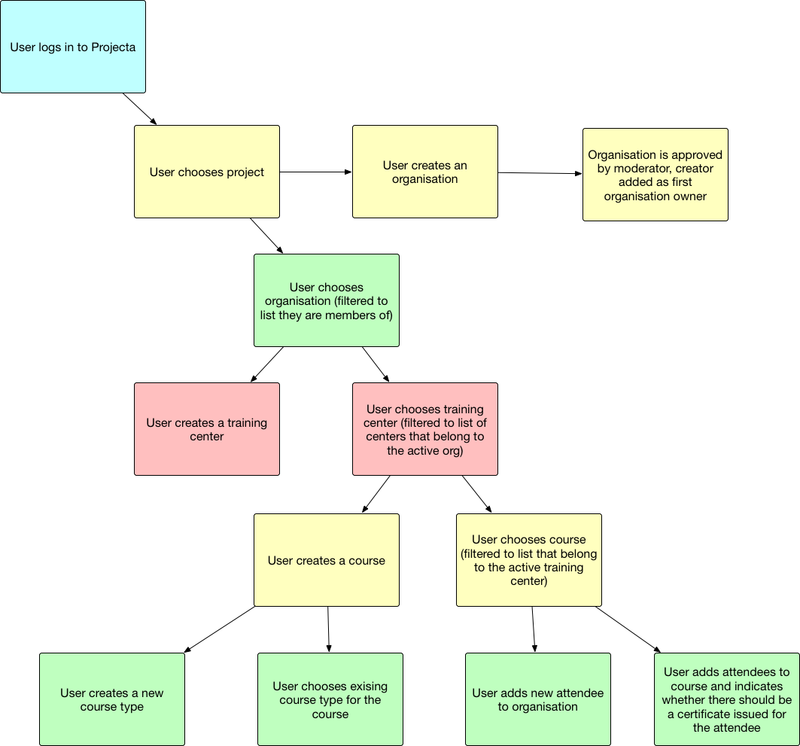 The following diagram provides a generalised overview of the certification process from the point of view of a certifying organisation. Computer based testing: Favoured by industry, in this approach the project owner would create a large pool of questions and then provide a test environment where a random subset of questions are allocated to the person being tested and they would carry out an online examination. There are a few issues with this approach including the need for a way to verify that the correct user actually undertook the exam and not a proxy, the need for a large amount of project input to create and maintain the test questions, and the general trend for examinees to go online and share the questions the were asked for future examinees. There is also the issue that sometimes complex (especially graphical) software is hard to examine in an environment where text based answers are expected. Portfolio based testing: Favoured by academia, this approach requires attendees to submit mini-projects or other projects such as maps and reports to demonstrate their competency. This has a downside that each evaluation is very personal and subjective. Neither of these systems is really suitable for our needs so we have opted for a third choice: In this approach we create a "web of trust". In this approach we trust the organisations that provide training to properly issue certificates for their course attendees. We spend our time verifying the certifying organisation and then trust them to 'do the right thing' after that. Setting up the certification programme for your project starts with the creation of one or more certification managers in your project. Certification managers are moderators for the certification programme in your project. Only a project administrator can update the list of certification managers. 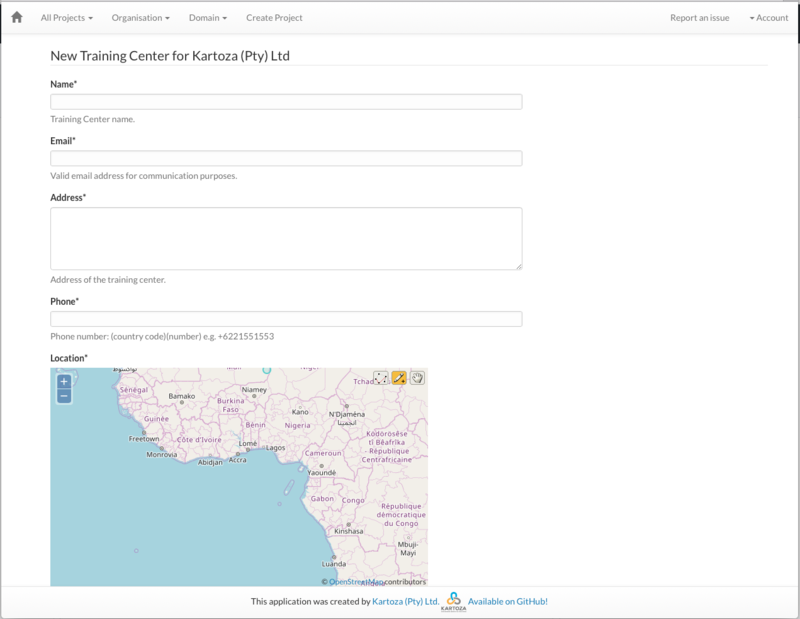 The project owner and certification managers can then manage which users can approve and manage the list of certifying organisations. Whenever a new certifying organisation is registered, the project certification managers will receive a notification by email that there is a new organisation ready for review and approval. You can manage the list of certication managers for a project by clicking on the project edit button and then scrolling down until you find the certification managers list. Add and remove members from the list as needed and then save your project. To register a new certifying organisation, go to a project page and open the Certification menu. Click on Organisations and then click on the asterisk icon next to the page heading for Certifying Organisations. On the registration page you can fill in all the key details about your organisation including its, address (physical and online), contact person email, logo and so on. It is important to include a logo if you have one as that will be used on the certificates issued by the system. We recommend that you use a logo with a square aspect ratio for this. The approval process is largely a norm established in your project. One approach that can be taken is to approve 'known' organisations associated with the project based on your knowledge of the organisation's skills and competencies. For organisations that are not known to the project, a more rigorous process can be followed whereby moderators review the applicant certifying organisation's web site, ask to review their training course curricula, the training materials used by the organisation, or possibly even sit in on a training course conducted by the applicant to verify that they "know their stuff". Once the organisation has passed approval, the organisation owner and mangers will be able to proceed with setting up courses, conveners and so on using the management interface provided on projecta. Typically you will first create Training Centers, Course conveners, Course types and then create courses. A training center is a venue where you regularly conduct courses. Each organisation may have one or more training centers. If you are doing onsite or 'roaming' training, I suggest to either make a training center per location where you offer training, or create a single location (e.g. at your offices) that you can use as a proxy for other venues. In the future we will provide a map with pins showing where upcoming training courses will be provided for all Certification organisations. A course convener is either the trainer or the person responsible for the course. The certificate will be issued with the name of the course convener on it. Be sure to upload a digital signature for each course convener if you do not want to manually print and sign the certificates. Course types describe the different content offering you offer. You can include how many hours of instruction that are included in the course. If you do this, this information will be included on the certificate when it is generated. Probably you will define your course types around topics (e.g. working with databases) or around skill leve (beginner, intermediate etc.). A course is run at a training center by a course convener for a particular course. When creating a course, you can add attendees to the course. Attendees do not need to register on the Projecta web platform. You can create your own custom templates for the certificates that you issue. 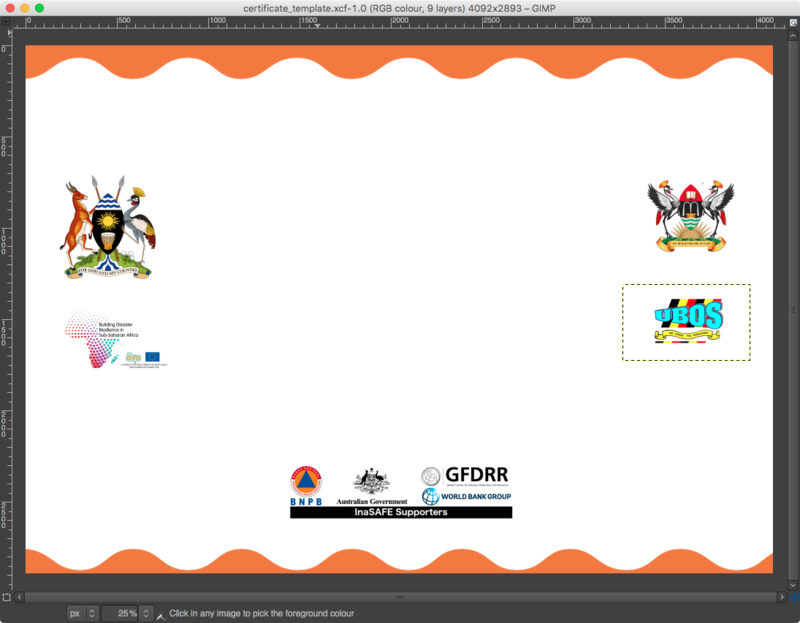 In this workflow we use the Gimp to open one of the generated certificate PDF's from your course. Next decorate around the pre-planned text from the certificate. We don't have a templating language so you cannot move the pre-defined elements currently. Once your template is prepared, you hide again the original certificate layer and export your gimp document as a PNG image. 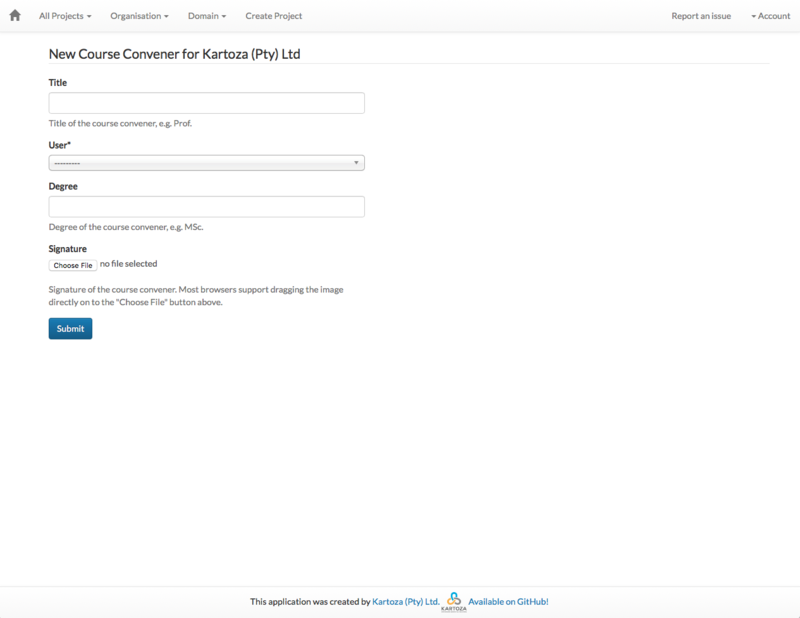 Now upload the image to the course edit page and test your template by adding one course participant and using the ‘Print Certificate’ icon to preview it. Note that the template you upload should be formatted to A4, not US Letter. We are planning to introduce an e-commerce system soon. When that is implemented, you will be able to purchase credits which can be used to then pay for the certificates you issue. Currently we work on a somewhat manual system - when you are going to be running a course, ask one of the project administrators to load credits for your organisation. Then add attendees to your course (you can do this individually or in buld by providing a CSV file). We are planning to introduce an e-commerce system soon. When that is implemented, you will be able to purchase credits which can be used to then pay for the certificates you issue. 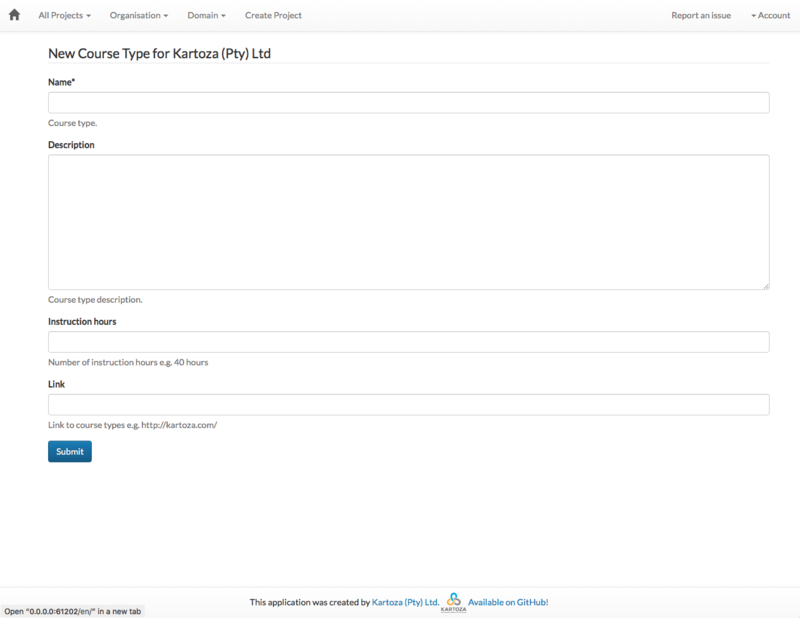 Currently we work on a somewhat manual system - when you are going to be running a course, ask one of the project administrators to load credits for your organisation. Then add attendees to your course (you can do this individually or in bulk by providing a CSV file). Once you have issued certificates for each attendee you can issue certificates. The process of registering an attendee and issuing the certificate is separated so you need only issue certificate to those that pass your course. Each attendee will receive an email with a link to a downloadable copy of the certificate. 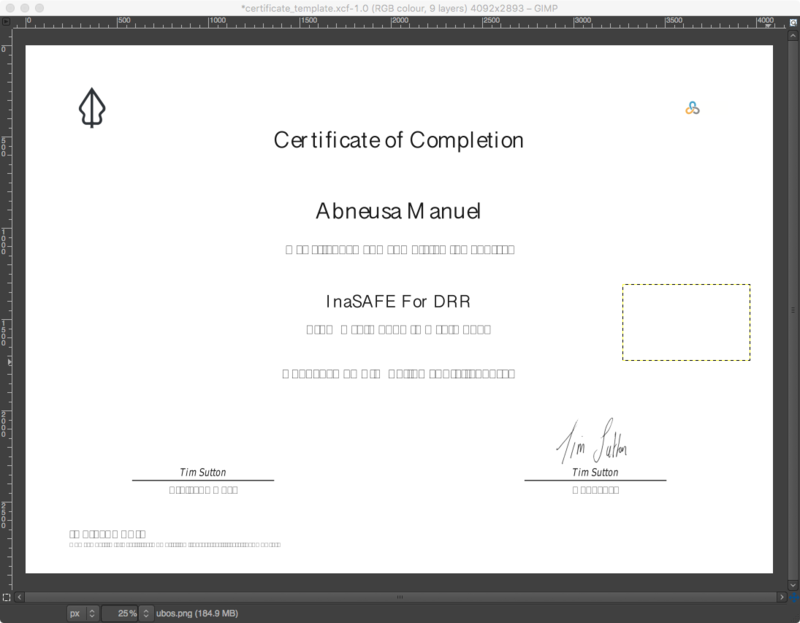 The certificate includes a unique number which is allocated to each certificate and a unique link that they can provide (for example in their CV) to verify that they have indeed completed the course. This mechanism should help to prevent fake certificates. Course conveners should upload a digital signature to their profile. This is embedded into the certificate together with the digital signature of the project leader (who needs to set this in the project profile options page). 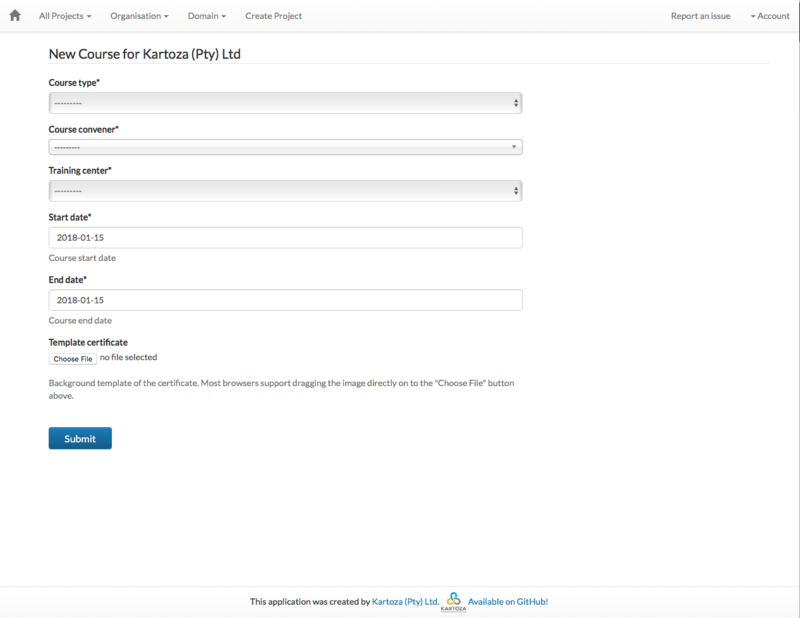 If you have any problems using the certification platform please file an issue at https://github.com/kartoza/projecta/issues.